One of the benefits of taking an entire winter to write a book about Montana’s ski areas is that I had a chance to sample them all — from the slopes to the saloons. Each is worth visiting and is special in its own right, but several stand out in certain categories. I’ve compiled this “best of” list so you can plan your winter visit accordingly and give them each a try on your own. The state’s 16 public ski areas have been separated into geographic regions to make it even easier. Best Black Diamond Terrain: In this region, Whitefish Mountain is the place to go for steeper, more advanced terrain. Particularly on the mountain’s north side, experts have plenty of options including Hellroaring Basin and the trails served by Chair 7. The front side of the mountain is no slouch either, and backcountry enthusiasts can leave the ski area boundary for powder shots on Hellroaring Peak. Best Intermediate Terrain: All of these mountains offer excellent intermediate runs, but the blue trails at Lookout Pass will reward skiers and boarders with long, gently sloped cruisers —especially on the North and Montana sides of the mountain. With half of the ski area’s trails rated as intermediate, there are enough runs to keep the legs burning all day long. Best Beginner Terrain: With several lifts dedicated to beginners-only terrain, Whitefish Mountain again rules this category. Chair 3, Chair 6, and Chair 9 all have excellent trails for those perfecting their turns, while the Big Easy carpet is an ideal place to try skiing or snowboarding for the first time. Best Aprés Ski Bar: While the Hellroaring Saloon and the Bierstube — both at Whitefish Mountain — are two of the most legendary bars in the state, it’s hard to beat the unique view at Muley’s Pub at Blacktail Mountain in Lakeside. Since the main lodge and parking lot are at the top of the mountain, an après ski cocktail at Muley’s includes amazing views of Flathead Lake, the Mission Mountains and Glacier National Park — not to mention good food and locally brewed beer. Best Ski and Soak Option: Quinn’s Hot Springs, located in Paradise, is an easy hour-long drive to Lookout Pass. With cozy log cabins, a great restaurant, and six pools to soak and swim in, Quinn’s should be on everyone’s hit list — and ski and stay packages are available to make the decision even easier. Best Black Diamond Terrain: While all of these mountains offer decent expert terrain, only Discovery Ski Area offers an entire chairlift dedicated to steep black and double-black terrain. The north-facing Limelight chair features steep trees, narrow chutes and cliff drops that will have even the most seasoned experts wanting more — especially on a powder day. Best Intermediate Terrain: Lost Trail’s Saddle Mountain chairlift features 1,200 vertical feet of mostly intermediate runs, perfectly suited for those skiers and riders looking to challenge themselves. The gentle slopes are also great for working on those powder turns without committing to steeper, black diamond terrain. Best Beginner Terrain: My young son linked his first snowboard turns on Discovery Ski Area’s Gold Bug run, one of the best green trails in the state, so I’m a little biased here. The wide open slopes on the Jubilee chairlift — including Gold Bug — give beginners the confidence to move up to the plethora of awesome blue runs available at Discovery as well. Best Aprés Ski Bar: The Last Run Inn at Montana Snowbowl has achieved legend status within the state’s ski community. The wood-fired pizza alone is worth a drive up to the base area — even if you aren’t skiing. a nice restaurant/bar and excellent soaking. Best Black Diamond Terrain: This may be the toughest choice, as all of these ski areas are known for challenging, adrenaline-pumping expert terrain. Although the Ridge at Bridger Bowl is as tough as anything out there, Big Sky Resort gets the nod here based on the sheer amount of available acreage. Expert-only trails can be found all over the 5,800-acre resort, including the steep bowls off the 11,166-foot summit of Lone Peak, the rocky chutes of the Headwaters hiking area, and the tightly gladed tree runs on Andesite Mountain. Best Intermediate Terrain: Again, Big Sky Resort scores here with excellent intermediate trails on Lone Peak and Andesite Mountains. Long, wide-open cruisers can be found everywhere, allowing those improving skiers and riders to test their skills all over the resort without having to stick to just one or two lifts. Favorites include Calamity Jane, Big Horn, Sunlight, Elk Park Ridge, and Horseshoe — one of the most scenic intermediate runs in the state. Best Beginner Terrain: While all of these resorts — except for Beartooth Basin, which is for experts only — offer dedicated lifts for newbies, the expanded beginner area at Bridger Bowl created by the installation of two new lifts last season completely changes the nature of the mountain. The new Alpine lift boasts wide open runs and the new Powder Park lift has easy blue trails for those reaching for the next level. Add these to the learning zone by the Snow Flake lift and the green runs accessed by the Virginia City and Sunnyside lifts and Bridger makes for a perfect place to get started. Best Aprés Ski Bar: While the base areas of these resorts have plenty of après activities, the best place to hang your hat at the end of the day is the Snow Creek Saloon in Red Lodge. A little bit rough and tumble and a whole lot of fun, the Snow Creek serves up drinks in a classic powder hound atmosphere — making it a must for any Montana snow lover after a day on the Red Lodge Mountain slopes. 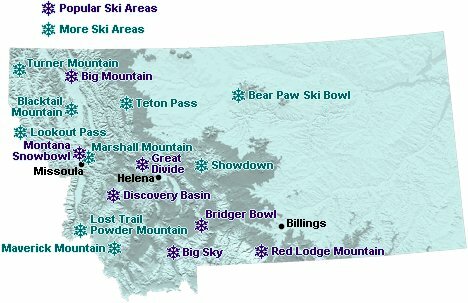 Best Ski and Soak Option: Lacking any hot springs in the immediate area of these ski areas, your best bet for a quick soak is to hit Bozeman Hot Springs after a day at Bridger Bowl or Big Sky. If you’re looking for lodging, a stay at historic Chico Hot Springs south of Livingston — about an hour away from Bridger Bowl on the scenic Jackson Creek Road — is worth the extra drive. Best Black Diamond Terrain: While none of these ski areas are particularly known for their abundance of expert terrain, Teton Pass Resort gets the top spot because of two factors: The No Name platter lift — which gives advanced skiers access to an entire mountain dedicated to fun, ungroomed black diamond runs — and hiking access to the summit of 8,600-foot Mount Lockhart, which is only for those who have avalanche rescue equipment and know how to use it. The resort offers guided excursions to different zones on Lockhart on Saturdays throughout the season, making Teton Pass a great destination for those interested in the backcountry. Best Intermediate Terrain: Looking at a trail map from Great Divide reveals a healthy dose of the color blue, as about 40 percent of the ski area’s runs are rated for intermediates. If you’re above average in your ability but not quite ready to tackle the steeper, black diamond terrain, Great Divide gives you plenty of intermediate options all over the mountain — especially on the trails accessed by the Wild West and Mount Belmont chairs. Best Beginner Terrain: Show up at Showdown Montana on any given Saturday and you’ll see throngs of people of all ages learning how to ski and ride. And for good reason — the ski area is nestled in the Little Belt Mountains and has some of the best learning terrain in the state. The Sluice Goose Caboose lift is designed to get kids up to the learning area and at the same time keep the more aggressive skiers on the other parts of the ski area, making learning easier and safer for everyone. A dedicated kid’s terrain park is the icing on the cake, too. Best Aprés Ski Bar: While the Waldron Creek Saloon at Teton Pass may serve up some of the tastiest food, the Missing Lynx Saloon at Great Divide is the best place to be after the lifts stop running. The atmosphere is always lively — with bands often playing on the weekends — and the large deck gets packed on sunny spring days. The bar can get especially rowdy on Friday nights when Great Divide offers night skiing throughout the season. Best Ski and Soak Option: The newly remodeled Spa Hot Springs Motel in White Sulphur Springs makes for a great base camp for a weekend at Showdown and offers reasonable ski and stay packages. Pay the extra fee for new section of the motel and you won’t be disappointed, and the quaint ranching town of White Sulphur Springs is a fun place to spend a few nights. Montana Skiing, with photos by Craig Hergert and text by Brian Hurlbut can be ordered from www.MontanaPanoramic.com, or your favorite bookstore.